I still think fondly back on when I played the first Mass Effect. It had so much going for it, and I was so excited about the game—I remember tearing through the campaign, loving the story, and tolerating the somewhat janky combat and technical issues. I also remember the interface. It was something that I was only marginally aware of as I actually browsed through my inventory and character-sheets, but the farther I got from the game, the more I realized how lackluster it was. And then, I read Krystian Majewski's Massive Interface Fail series, and I finally understood: The first Mass Effect's user interface was an unmitigated disaster. Majewski is the German game designer responsible for the IGF-nominated TRAUMA. 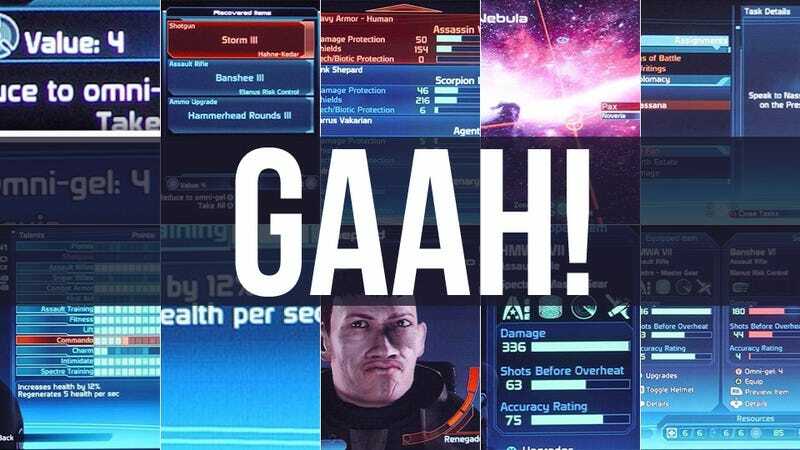 In "Massive Interface Fail," he goes through every aspect of the Mass Effect UI with a fine-toothed comb, and comes up with an astonishing list of problems, inconsistencies, and oversights. In creating his deliberately ugly avatar "Honk Shepard," Majewski cites the Wii's Mii creator as a much more intuitive character creator. I gotta say, I really like the Mii creator, and I've been able to make a Mii that looks very much like me, despite the simple settings, while my much more complex 360 avatar still doesn't really look like me. But things get good when he turns his eye on the HUD. In the image to the left, we've got the party health indicator, which is the first clear sign that things went off the rails with the design of this game's UI. (Bad) Styling obscuring function: Let us focus on the health bars in the lower right corner. Off the bat, that entire area is set in italics. An unfortunate choice as it is difficult to compare the three health bars with each other when they are aligned along diagonals. Also, it makes them all rhombuses and you know what they say about rhombuses. What baffles me is WHY they set that part of the interface in italics. Italics aren't use ANYWHERE else after all. He goes on to point out another glaring flaw: Shepard's health bar is longer than the other characters', but Shepard does not in fact have more health. The icons are terrible (seriously what is with that grenade icon—it may be accurate, but it's confusing as hell and looks like a hockey puck), and goes through the hideous glut of information that pops up every time you take out an enemy, as well as a half-dozen other huge flaws. Character management gets the same treatment, with the percentages getting knocked in particular—if a suit of armor "increases health by 12%" but also "regenerates 5 health per sec," what does that mean? Context is entirely absent. The more you think about it, the more you realize that you kind of just smiled and went with it, not even really caring that none of the data on screen made any sense. I know I did. Part 2 is my favorite, as Majewski digs into the equipment subscreen, which upon revisit is probably the most broken part of the entire interface. Or, as he puts it, "welcome to the biggest interface flaw of the entire game and quite possibly the worst game interface ever." As Majewski points out, there is no actual "inventory" in Mass Effect, just the "equip" menu. He goes through the many ways that the game misuses its considerable screen real-estate, he points out that even the Game Boy game Mystic Quest was able to show more information on the screen than Mass Effect. It just keeps going, and going, and going. There are far, far more observations in the finished collection than I've shared here—all together, it's a terrifically well-assembled, thorough critique of a major game's interface failures. If you're anything like me, you'll read it and think, "Wow, I never even really complained! I just swallowed it and played the game." I go back and read the entire thing once a year or so, just to remind myself not to overlook the basic terrible design decisions that gamers put up with every day. It goes to show how far we'll will go to enjoy the games we play—games may have gotten easier to play, but they sure can be hard to manage.